Data Robotics has launched the second generation of its Drobo "data storage robot", upping the unit's data-handling speed and adding a pair of Firewire 800 ports to the original's USB connector. 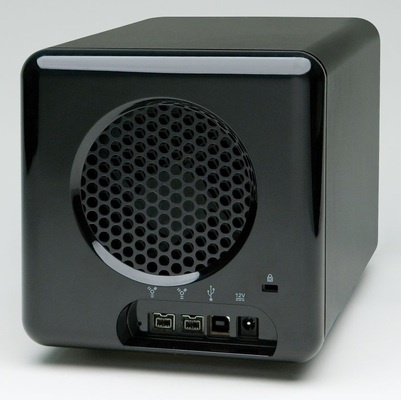 It's all in the name of performance, DR said, and the fact that a fair few Drobo users are Mac owners. The 2G Drobo incorporates not only the extra portage, but also a new, faster processor and improved firmware to control how your files are arrayed across however many hard drives the unit contains. 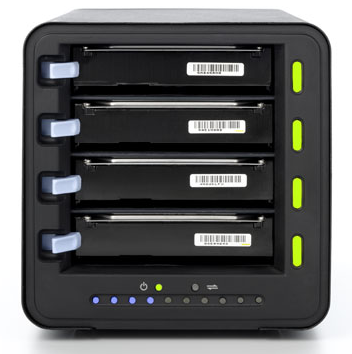 A Drobo has room for four SATA hard drives. Insert at least two, of whatever capacity, and the device provides full security against the failure of any one drive, and allow you to remove and replace a duff drive while still accessing your data. Extra drives come on stream almost as soon as they're added to the array. That's thanks to DR's proprietary software. However, in the past that's been countered by a big speed slowdown that begins to kick in as the array - presented to the host Mac or PC as a single file-space, becomes full. Tom Loverro, Data Robotics' Director of Product Marketing, told us that the company has refined its algorithms which, combined with a faster ARM processor, and those Firewire 800 connectors gives a doubling of performance, delivered by faster data transfers, particularly when the system gets full. Loverro said owners of the first-gen Drobo will be offered a firmware upgrade bringing some of the benefits of the new model to their machines. It will be made available in a couple of month's time, he said. The new model, available in the US immediately and in Europe later this month, is priced at $499 - the same price as the previous version. The UK price will fall, from £350 to £299. That's the unit price, without drives. DR's DroboShare network connectivity add-on is $199/£160 extra. Drobo 2G is compatible with FireWire 400, provided you have a suitable adaptor cable. DR calls the Drobo a robot because it entirely automates the array set-up and copes with drive insertion and removal off its own bat. A simple on-device UI provides green, amber and red status read-outs for each drive and a row of ten blue LEDs to indicate overall capacity utilisation.